Walt Disney World may not be the first place you think of when romance is mentioned but the resort is filled with beautiful activities for couples and romance if you know where to look. Disney is the perfect destination for couples looking for some time together, rest and relaxation. This Disney experience is still relatively new as it first opened in 2011. Nestled on the coast of O’ahu, Hawaii this beachfront property oozes serenity, romance and fun. A vacation at Aulani is the result of Disney magic merging with the rich culture of Hawaii. In 2014 the resort was voted number one family hotel in the country by Travel & Leisure Magazine. Lounge in one of the sparkling pools on the resort, enjoy the lush golf course or get lost in Laniwai spa as you experience a couples massage. Couples can also enjoy excursions off the property to experience even more of the local culture as they go dolphin and whale watching by boat or explore the beach on horseback. Aluani is the perfect option for Disney fans hoping to change up their normal Walt Disney World routine while retaining the magic of a Disney vacation and seeing a new resort. The rustic beauty of The Wilderness Lodge makes it the perfect resort destination for a romantic getaway. Towering totem poles, a mountain stream running through the lobby and the huge stone fireplace creates a romantic atmosphere as soon as you enter the resort. Hot and cold whirlpool spas and a gorgeous pool surrounded by pine trees and rock give the feeling that you are relaxing in the streams of the American west. Delicious dining opportunities at Whispering Canyon Café and Artist Point are available in the hotel so guests can enjoy incredible meals without ever leaving the comfort of the resort. The resort is gorgeous year round. However, I especially enjoy the romantic cozy details of the resort during winter visits. As one of the original Disney resorts, the iconic Disney flavor of the Contemporary is always a crowd pleaser. The proximity to the Magic Kingdom, convenience of the monorail line, beauty of the A-Frame design and dining options in the resort make it perfect for a romantic getaway. Couples can rent cabanas by the pool or enjoy guided watersports and fishing trips by day to break from the traditional hustle of Walt Disney World. An evening spent at the California Grill atop the hotel enjoying a delicious meal with a moonlit view of the castle is incredible. Guests dining at the California Grill have the opportunity to enjoy the private fireworks viewing area outside the restaurant as music from the Wishes fireworks display is piped in over the speakers as fireworks erupt over the castle at the end of the day. The newly expanded Polynesian Village is more beautiful and romantic than ever. The South Seas flavor of the resort has made it a Disney favorite of mine for years. The gorgeous pool, incredible resort dining and breathtaking views of the Magic Kingdom make it an incredibly romantic resort. The Spirit of Aloha Dinner Show provides guests the opportunity to enjoy Hawaiian culture at a dinner show that boasts delicious food. Thanks to the new expansion, couples can now enjoy the added privacy of villas or bungalows at the resort. These new resort rooms offer location options that provide guests breathtaking views of the resort or lagoon overlooking the Magic Kingdom. Viewing the Electric Water Parade from the comfort and privacy of your own bungalow at the Polynesian Village is about as romantic and magical as a vacation can get. The Yacht & Beach Club is an incredible resort for lovers because it provides so many relaxing activities and amenities that the couple need not leave the resort for food, fun or relaxation. The resort is known for the gorgeous pools that line the property. A lazy river, several hot tubs, adequate poolside lounging space and sand covered pool bottoms create a relaxing atmosphere for guests that may leave them craving multiple pool days and lure them away from the busy resorts. 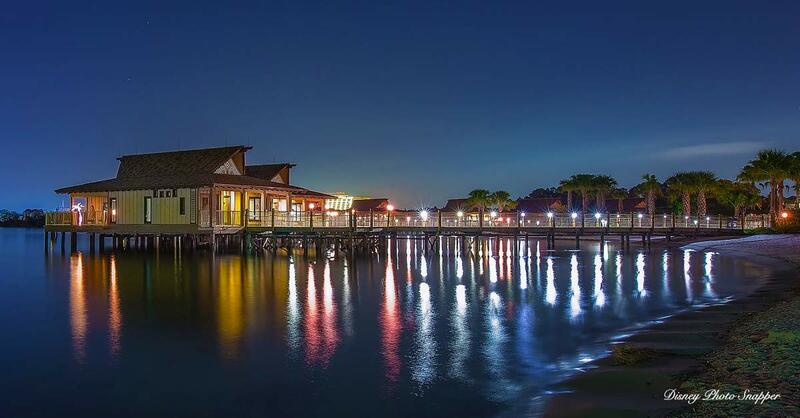 Proximity to the Disney Boardwalk means that lovers can spend the evening strolling beneath the beautiful Boardwalk lights, sampling baked goods at the Board Walk Bakery or enjoying mixed drinks from Board Walk Joe’s Marvelous Margarita stand.